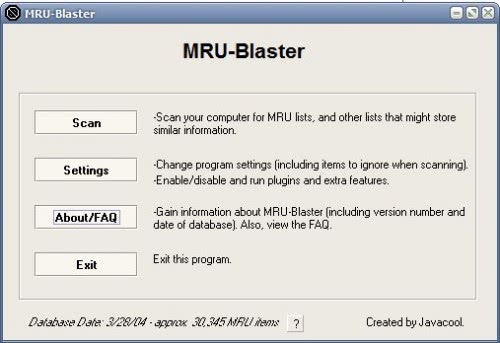 MRU Blaster (via Technix) is a software program for Windows operating systems that cleans the Most Recently Used files on the computer system. Microsoft thought it would be a good idea to store files that have been recently used in various places to offer the users a way to load those files more quickly the next time they are needed. What Microsoft has not taken into account are privacy sensitive users who do not like this type of information recorded on their system. The cleaner MRU Blaster takes care of the most recently updated files in Windows by deleting the information in Windows. CCleaner was used to test the effectiveness of MRU Blaster by cleaning Windows with it before running MRU Blaster. Even after cleaning the system with CCleaner the program did find 257 entries that could be additionally cleaned on the system. The user can specify the applications and locations that should be scanned and cleaned in the program's settings which is also the location to download the two available plugins that clean cookies and temporary files. MRU Blaster comes with a scheduler that can be set to run in specified intervals. The application has to be running in the background for this though. Seemed to do what it says. Worked fine for me and cleared them all out. Thanks for the download!